My family doesn't celebrate Halloween. That's a little controversial within our own extended family. Even this week a man in line at Costco asked one of my boys what he is going to dress up as for Halloween. People say it's just fun. From well before our oldest son was born, my husband and I just chose to ignore Halloween. We didn't like the holiday but we couldn't quite explain our reasons why. When our oldest was born, we knew we needed to find a way to explain our position, but we continued to ignore Halloween for a couple more years. Through the preschool years, just telling him that Halloween was something our family didn't celebrate was sufficient for him. A few of years ago, we finally got our act together. Our oldest son was seeing the world's Halloween traditions and deserved a Biblical and practical explanation. The roots of the holiday are purely pagan. There's not much, if anything, that we feel can be salvaged. Half the candy we would get from trick-or-treating would be thrown away because no one in our home would eat it. We also have food allergies that make accepting food with unknown ingredients difficult. I'd rather take my boys to the store to get a treat that they really like. We have a goal to be debt-free. Spending our money on costumes and candy for a holiday that we don't think lines up with our family beliefs doesn't fit with our financial goals either. The roots of Halloween are purely pagan. Much has been written about this so I won't rehash the history here. I'd suggest that you read articles here and other places to research the roots for yourself. But the real question is: Can Halloween be redeemed? Those are the things I want my boys to think about. I want my boys to be immersed in truth from Scripture so they are prepared when they encounter sin and evil in the world. Now is not the time to push them into that world. Now is the time for preparation. Our time is finite; we have a limited supply of it. I'd rather spend this time of year celebrating God's provision of harvest, the anniversary of the start of the Protestant Reformation with Martin Luther's 95 theses, or All Saint's Day. So, rather than spending our time on Halloween, I'd rather focus on things that are edifying for my children. I respect that there are other parents and families who hold a differing opinion. I recommend taking a look at Luke Gilkerson's take on redeeming Halloween. He also has a great guide for Christian parents wrestling with Halloween. If you've come to the conclusion that Halloween is not for your family, Trisha Gilkerson has a great list of ways to celebrate Reformation Day as an alternative. You should also look at this book on Martin Luther from Danika at Thinking Kids as a starting point for Reformation Day studies. Halloween will always be controversial. The Bible doesn't talk about Halloween by name and therefore doesn't give us a clear-cut answer on the subject. I simply want to equip you to deal with the topic and point you to resources to help you disciple your kids on either path. Tell us… Where does your family stand? Do you celebrate Halloween? Do you celebrate an alternative? Why? How do you celebrate? How did you come to this conclusion? I admire you sticking to your beliefs. I wonder if you all put up a Christmas tree? Christmas trees are also derived from a pagan tradition. I celebrated Halloween when I was growing up and my child does so today. I never once called myself a pagan, nor will I. I am an active Christian. I think it is what you make it. If you make it a holiday about pagans, then that’s what you get. But if you make it a holiday where you can dress up and be silly and forget your worries for a few hours one night, that’s what you get. In no way of doing that are you supporting paganism, the devil or anything else like that. You are making memories and enjoying the fun of the evening. That’s my opinion. April, we do usually put up a Christmas tree. The tradition behind the Christmas tree, while pagan, is not demonic and dark like most Halloween traditions. What’s in the Bible? has a great explanation of Christmas trees in their Why Do We Call it Christmas? DVD of how the Christmas tree was “redeem” and incorporated into Christmas traditions. I agree that Halloween can be fun. Unfortunately, if you’re going to participate in traditional Halloween activities like trick or treating, it’s going to be hard to protect your children, especially younger children, from the darker and more gruesome aspects of Halloween. If you take that route, you have to be prepared for how to give Biblical answers to your kids. I grew up celebrating Halloween & then when my Dad got saved I remember going to evangelicalistic type Harvest Parties…some 😉 )you dressed up (no pick allowed) & some just Harvest parties to keep the Christian kids from celebrating.Until my Dad did his research & declared Halloween the satanic holiday it it & told us about animals & kids sacrificed that night. A day for witches & all that isn’t from God. When we had kids by hubby was OK with Halloween & I compromised with the had easy party at Church. I’d make excuses for it because the message of Jesus was being shared….until it wasn’t anymore & everyone was being g welcomed dressed as ghosts or witches or demons. The night we brought our nephew and stayed until the doors closed and there was no gospel sharing only send the kid home with the most candy in town with hopes they come on Sunday, I was convicted! We are acting no different from the world! No more Halloween for us…I did my research…Halloween is EVIL & I wish more Christian people would stand up! We put up a Christmas tree but we don’t celebrate the demonic holiday. The tree is not our focus Christ is! (Maybe God will change my heart towatds that in the future….my parents dont have a treeThere is no Christ focus on celebrating Halloween. That is exactly our view. We used to think it was okay to have the alternative Fall Festival or Hallelujah night and say we were celebrating Jesus but really we weren’t. When you know better you do better and that is exactly what we are trying to do and teach our church and children. I love the way you have stated this. I stopped celebrating Halloween with my children when my oldest was 5 and they adapted very well. We openly discuss choices and what it means to “guard or heart”. As an alternative our church does have a Harvest Fest but it in no way is similar to Halloween. The children don’t dress up. We have games, bounce houses, and what not for the younger children. The older children have a musical concert or play that is Christ centered. I mean everyday is the day the Lord has made so we rejoice and are glad in it. God Bless you and may the Holy Spirit speak to those that are lukewarm or on the fence about these things. I take it you don’t celebrate Halloween, Andi. Do you substitute something else? Or just pass it by? 🙂 As we all should! Thanks, April, for being willing to write on this controversial topic and stand up for your convictions. We are called to be separate from the world as believers and in doing so, our lives are going to look different. I think this is hard for a lot of people. I struggle with it. As a “people pleaser”, I hate conflict. It’s an area where the Lord is growing me. But, conflict with the world is a big part of the Christian life and it’s an important concept to teach our children. 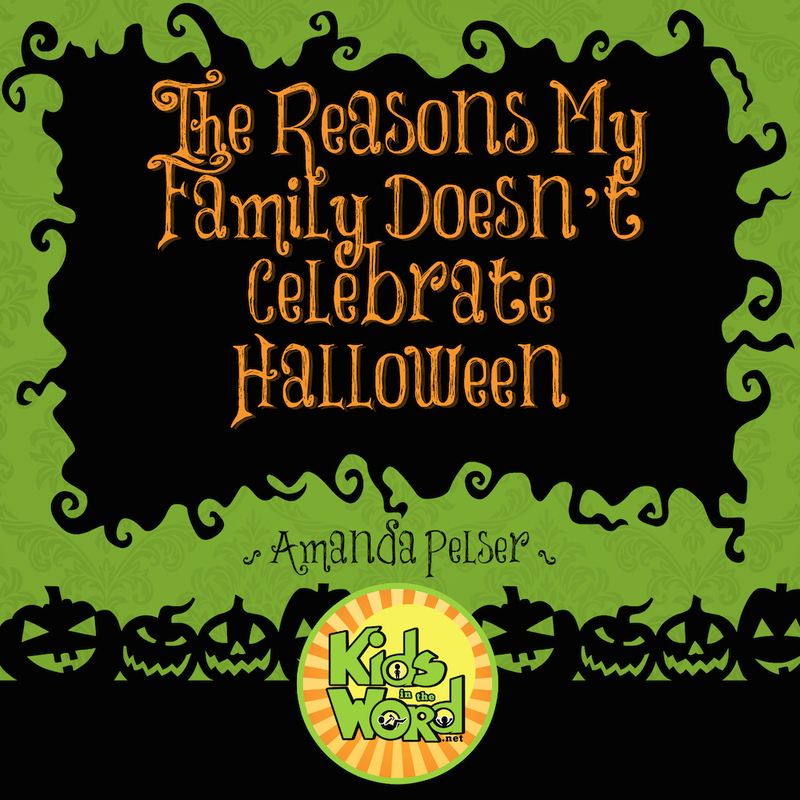 Our family doesn’t celebrate Halloween for many of the same reasons you mentioned. We do love pumpkins, gourds, mums, and all things fall, though! (We don’t celebrate Christmas, either, as a personal conviction due to the pagan roots. But that’s a whole other topic and WAY more controversial! 🙂 Blessings! Kelly, I feel that the main difference between Halloween and Christmas are the demonic and seriously dark things that go into Halloween. I feel that the Church has found ways to redeem many of the originally pagan Christmas traditions over the years, pointing people back to Jesus. Again, the What’s in the Bible? DVD is a great resource on that subject. These days I’m personally more concerned about the commercialism that our current culture has laid on top of what the Church redeemed! No matter what your stance on these “non-essentials” of the faith, you have to be able to explain it to your kids using Scripture. We want them to be able to explain and have a foundation for their faith. Can you please explain what you mean by demonic and dark? Again, I know I am in the minority here, and I do appreciate your viewpoint, but honestly, I have never run into anything demonic or dark. Are you talking about the decorations or costumes? I’m sorry. I’ve never experienced anything demonic or dark about going from one door to the next receiving candy so maybe I’m just missing the whole point. I guess I also don’t appreciate the ideology that you can’t celebrate Halloween and still be a believer. I also hope that you realize that I am asking these questions to learn, not to flame anyone. April, I am referring to witches, demons, goblins, ghouls, ghosts, and such in costumes and decorations. In my opinion, these types of things start going beyond “pagan” traditions to begin pointing demonic/satanic practices. You’re right. In general, there is nothing demonic about going door to door for candy. The problem for me is that we don’t have control over the way that people in general celebrate Halloween. I don’t feel that my boys need to be exposed to those things. Therefore, we have chosen to remove ourselves from it. When we encounter decorations or ads or other references to Halloween, we talk about why we don’t believe that it is a good use of our time or resources, and what we feel we should be focusing on instead. It is unfortunate that some believers take this and other non-essential to an extreme. Halloween is not mentioned in the Bible. It is not an essential to the Christian faith. You certainly can find ways to celebrate Halloween and be a believer. The Gilkersons’ resources at Intoxicated on Life that I linked to in this post show how you can be a Christian and find ways to redeem parts of Halloween celebrations. I see what you mean. Thank you for explaining that. I guess I do agree with that. There are decorations and whatnot out there that are honestly over the line. Fortunately, so far we have been able to steer our daughter around that stuff, or maybe we haven’t but we have become so desensitized by it all nowadays that we have exposed her to it but not realized the impact it might have had on her. That does make me sad on so many levels. I do see what you’re saying though and really, I do applaud you for it and for not giving in to the pressure of it all. Whoops, in my original post, I meant to start with “Thanks, Amanda” (author of the article). But got the names mixed up, sorry! That was probably really confusing. Yes, Amanda :), you are so right that we need to teach our children from the Word and give them a foundation for their faith. I grew up in a Christian home, but the Word was not taught at home specifically and we didn’t discuss issues like this very often. When we did, it was uncomfortable because it was so rare! My husband and I are seeking to do things differently with our little ones. With Christ’s help… we can’t do it on our own! Kelly, that’s why Kids in the Word exists. We want to inspire, encourage, and equip you on this journey. Praying for you as you establish new patterns in your own family! One last post and I promise I’ll stop flooding your inbox! I do hope others share what they do as an alternative. I would be interested in reading about them. If you decide to not celebrate Halloween, how do you feel about Christmas? I don’t mind people choosing not to celebrate Halloween, but I am very curious if they put up a Christmas tree and other pagan traditions that we do at Christmas time. If Christians managed to redeem Christmas, why can’t we try to redeem Halloween too? And I forgot to ask why you don’t consider pagan traditions dark & demonic? Unfortunately, they are whether they “look” scary or not. Becky, I think the difference here is “pagan” versus “demonic”. The traditional definition of pagan refers to “heathens” or those worshipping false gods. Demonic is a step beyond to worshipping Satan, etc. We don’t participate, but for different (or rather, additional, reasons). I resent that it has become the opportunity to be the scariest or most immodest you can possibly/legally be in public. I resent that going into stores at this time places images of fear and darkness into my innocent son’s mind and heart and strikes conversations I think are completely unnecessary at 3 years old. He shouldn’t have to be afraid of Target or to walk in front of a store in a strip mall, nor do I think he should see images that dark to begin with. Plus there are the conversations about modesty and commercialism and they’re just not things I think are necessary conversations right now. I also think it sends mixed messages about safety and courtesy. We don’t go up to people asking them to give us stuff in normal social constructs, and we never EVER go to stranger’s houses to ask them for candy, so how can he understand this one day is different. All that to say, when he is older and can discern the light from the dark and has the Holy Spirit in Him and a mind of understanding, we may distribute candy so Trick or Treaters can come to OUR house so that we can be a light to THEM, but until he can discern that the images he might see for what they are and he can understand why we’re doing what we do, we will abstain. We have no objection to pumpkins, candy, or even playing dress up. We like harvest festivals and pumpkin patches but we steer clear of Halloween-ey things. Yes! Walking around on a normal day is hard enough on the modesty front. Halloween is even worse! And I agree – I don’t want my littles ones to be confused thinking that it is always socially appropriate to go up to someone’s door asking for candy. We don’t do Santa or Easter Bunny, either. Oddly enough, I’ve always granted exception to the Tooth Fairy, too. I think it’s because he/she doesn’t try to change or distract from the “real” meaning of something else. It’s just imagination. But we’ll see if I follow through on that when tooth-losing time comes. Jen, I think that’s a great point on the tooth fairy. My parents raised us not celebrating Halloween and we have carried on the tradition of “not celebrating” with our girls for the same reasons you listed. As a child we did participate in a few Halloween alternatives like Fall Festivals where we dressed up like our favorite Bible character. I remember dressing up as Jael — carrying a milk jug and a tent spike. Only the preacher was able to guess my identity! Now, we celebrate Reformation Day. Not as a Halloween alternative, but because the whole course of History was changed by the protest of Martin Luther on October 31, 1517. And that is far more worthy of celebrating than witches and goblins and creepy looking skeletons. It also gives us a great excuse to get together with friends on a night when we would really like to go somewhere without being bombarded by Halloween. Reformation Day is filled with so much historical significance all on it’s own. We’re studying the renaissance and reformation this year, so it has new meaning for us. Halloween isn’t just pagan in origin, it is pure evil in my opinion. If you look at what the pagans did on Samhain, you will see that what they did was evil. The Bible tells us to “Abstain from all appearance of evil.” 1 Thessalonians 5:22, and if Halloween doesn’t look evil, I don’t know what does. People don’t realise, but they are glorifying Satan by dressing up in gruesome costumes, putting up grotesque decorations and acting like the world. If professing Christians claim to love Christ, who came to give us life, then why glorify death which is Satan’s domain?! Amanda — we’ve celebrated Halloween to varying degrees in the past 13 years of parenting. We’ve never been big trick or treaters. What I loved most was my children’s beloved Christian preschool — it wasn’t Halloween but we would have a fall costume day — the year I loved best was Mother Goose. My Anna dressed up as a cat and carried a fiddle — Hey Diddle Diddle The Cat and the Fiddle. Another year it was Noah’s Ark and Grant was an adorable frog. We have fun dressing up and eating a little too much candy. We don’t do anything scary and trick or treating is mainly just in our neighborhood and our granddaddy’s neighborhood so he can see the kids. I truly believe most parents who celebrate Halloween are well intentioned. But, I agree with you in its demonic roots. We are Lutheran and always observe All Saints Day in our home. When I was teaching I never taught my little ones Halloween music (I was a music teacher) — a wise teacher once told me there is enough evil in the world already — why celebrate it even more? It’s not easy to tackle a topic like this and I appreciate that you did so with grace. Our world can be very cranky about most anything these days. I try to err on the side of not going overboard with anything and that has served me well. This year we will be at a football game out of town on Oct. 31 and my kids didn’t mind one bit! Sounds like our family – any chance you are of one of the COGs? Sue, I’m not sure what you mean by your question. Yes, but no particular group, as I feel that anyone that has the understanding are all in one family. I didn’t even think about it until my friend Jen noted immodesty in her comment above. Thanks for taking the time to create such a comprehensive resource for parents that is worth sharing! Posted this yesterday on the last year post – reposting here – OH my, our kids hate Halloween as much as we do. #1 is the only reason for our family. IMO, there is nothing that can “redeem” it and I see this as making excuses so that our kids don’t feel left out, said “no” to, and can still participate in the holiday. Satan must love this time of year – he doesn’t have to do a thing to disguise his evil, death, and destruction, it is all right there. God tells us to abhor and reject these things, as they are so vehemently opposite to His holiness and purity. I don’t get how it is OK to expose our children to severed heads, blood and gore, and horror at this time of year, and yet we would never do it all of the other times of the year. While my children love to play dress up and do it all year long, we don’t celebrate Halloween at all. I became a Christian as an adult and before becoming a Christian I was into New Age and all sorts of other practices. Halloween is pagan. For many years, we just passed up Halloween keeping the porch lights off, avoiding the stores during October ( a lot of the decoration was just scary to my little ones) and tv programs and commercials. Last year, my church held a FAll festival that resembled a lot like Halloween; trunk and treats and people came dressed up as gory characters. There was a lot of junk food that we don’t eat, but the kids enjoyed the hay ride and other games. Then one day my 5 y.o. said “are we going to celebrate Halloween this year?” I told her that we didn’t celebrate Halloween. “Yes, we do. Remember we went to Fall Festival last year? ” The naked king had been pointed out. We had compromised and without noticing we were doing something we didn’t believe in. Because it was a church event we didn’t really stop to think if it was appropriate or biblically sound. So this year, we stayed home and did not take part in the Fall Festival. The kids understood and there was no complaints. I feel it’s important to train our kids in the Christian faith and learn to NOT compromise. Slowly we are losing our faith by not being separated and just taking on the world’s customs. Children need to practice now to deny themselves if they are going to be able to do the same when they are adults. The temptations will be even bigger and we, as parents, will not be there to protect or shield them. I did not grow up celebrating Halloween. We don’t do the holiday with our kids either. We have generally celebrated reformation day. However some years we do something else like movies. Usually Luther. This year we are having over some new friends with kids over for chili and reformation activities. Our kids are 10-18. They all understand why. Someday they’ll decide for themselves. I’m thankful for each viewpoint here and am happy that you took the time to write this article and solicit feedback. Personally, I agree with Sue, Tereza, and several others that have stated that Halloween is a pagan holiday and there is nothing that can redeem it. It’s obvious what kind of spirit is behind it and, as such, is definitely something we as believers should avoid. I believe Christmas is pagan as well, although over the years people have put more effort into putting a Christian veneer over the originally pagan practices, giving it the appearance of being “redeemed.” The thing is, I don’t remember there being anywhere in scripture where God asked anyone to redeem pagan practices, rather He told His people to abhor and avoid them. How can we be separate and set apart, in the world but not of it, if we’re basically doing the same things the world does? Saying things like “we’re doing it for a different reason” or “that’s not why we celebrate it” comes across as an attempt to justify the celebration of these things, when I believe that we, as believers, should be more concerned about doing things that are pleasing to God. Thank you so much for sharing your thoughts. I could not open the link to “read articles here” I get a message that I’m not allowed onto that page. Any help?